The vast green square in the heart of Santo Domingo serves as the city's cultural and artistic showcase, being fronted by a cluster of four museums, as well as housing the city's most important cultural venues, including the Teatro Nacional (National Theater). 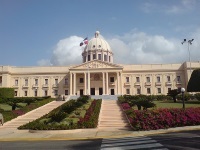 The square also boasts the likes of the Palacio Nacional, which houses the Presidency of the Dominican Republic; the Palacio de Bellas Artes (Palace of Fine Arts), a neoclassical building that is the permanent home of the country's National Symphony Orchestra; and the Boulevard 27 de Febrero, a pedestrian promenade located on the busy Avenida 27 de Febrero, which displays works of art from prominent Dominican artists and sculptors. The museums in the plaza are the Museum of Modern Art, the Museum of History and Geography, the Museum of Natural History and the Museum of Dominican Man. The National Theatre runs a full programme of opera, ballet, music and drama productions year rounds and visitors should certainly take in a show to round off their cultural experience in Santo Domingo.